A terrorist plot to assassinate a prince, justification of suicide bombings using the Qur'an, and apologetics for the use of terrorist violence. Chances are, none of these brought "outreach" or "bridge-building" to mind. Yet, take the State Department's pick of individuals sent abroad to reach out to the international Muslim community, and this is what you get. The ongoing Middle East tour by Imam Feisal Rauf, the man behind the "Ground Zero Mosque," generated controversy because its $16,000 cost is financed by the State Department. As the IPT reported Monday, Rauf has said that the U.S. "has more Muslim blood on its hands than al Qaida has on its hand of innocent non Muslims." Rauf once noted that grievances don't justify acts of terrorism, but backpedaled, saying "How do you tell the people whose homes have been destroyed, whose lives have been destroyed, that this does not justify your actions of terrorism?" Assistant Secretary of State P.J. Crowley explained in a briefing that the purpose of Rauf's current trip is to promote "international dialogue" and to "help people overseas understand the role that religion plays in our society." Rauf also made two trips in 2007 and one to Egypt earlier this year on behalf of the U.S. In an interview with IslamOnline, Rauf talked about his February 2010 trip which was described as a "tour to build bridges." The State Department's record of choosing emissaries for such missions is spotty at best. Its courting of Abdurahman Alamoudi provides the most embarrassing example. According to documents obtained via the Freedom of Information Act (FOIA), the State Department spent more than $40,000 dollars sending Alamoudi overseas between 1992 until 2001 as the face of American Muslims. Not long afterwards, the U.S. government found that Alamoudi was working with two al Qaida linked individuals plotting to assassinate then-Saudi Prince Abdullah. Officials in the United Kingdom seized $340,000 from him when they stopped him at Heathrow Airport. In 2004, Alamoudi pleaded guilty to several charges related to this plot and was sentenced to 23 years in prison. U.S. Attorney Paul J. McNulty called Alamoudi's sentencing a "clear victory in the war against terrorism." "Terrorists need money to operate, and the defendant was caught in the act of financing their deadly schemes," McNulty said. After Alamoudi's 2005 sentencing, the U.S. Department of the Treasury designated the Movement for Islamic Reform in Arabia (MIRA) for its support of al Qaida. According to a government press release, the State Department's man, Alamoudi, had given $1 million to the U.K.-based Saudi organization. Similarly, from the end of 2003 to the beginning of 2007, the State Department issued many grants for events featuring Imam Yahya Hendi across Africa, Europe and South Asia. Hendi spoke on various topics such as "Muslim Life in the U.S." and "Muslims in American Politics." In 2006, Hendi spoke on "Strengthening Moderate Islamic Voices in a Western [Society]," the FOIA records show. In 2003, the same year Hendi was sent on his first trip abroad, he testified as a character witness on behalf of now convicted Palestinian Islamic Jihad (PIJ) supporter Sami Al-Arian. During questioning Hendi was asked whether suicide bombing operations are sanctioned by the Koran. Hendi answered, "Yes." Likewise, just last month, the Council on American-Islamic Relations (CAIR) Michigan Executive Director Dawud Walid made his second trip to Bamako, Mali as part of a program funded by a State Department grant intended to lead to "sustained interaction" between the U.S. and Mali. CAIR was born out of the Islamic Association for Palestine (IAP), a Hamas support arm in the United States, and was listed as an unindicted co-conspirator in the Holy Land Foundation Hamas financing case which ended in all guilty verdicts in November of 2008. In testimony, FBI agent Lara Burns cast CAIR as a front for Hamas. The FBI cut off communication with the group in 2008, citing HLF evidence that tied CAIR to Hamas. While Walid made some positive comments about the U.S., he also used the trip as an opportunity to cast a shadow of suspicion around law enforcement and the FBI. Walid told his audience that "[s]ince the tragedy of September 11, 2001 American Muslims have been subjected to increased discrimination from racial and religious profiling by law enforcement." Walid also made sure to criticize the shooting of Luqman Abdullah, a Detroit imam who was killed in an FBI raid last year after agents say he fired the first shots. At the Malian conference, Walid said that Abdullah was killed "during a raid by law enforcement agencies based upon an investigation of his mosque, which ended up proving no links to terrorism or treason." However, a criminal complaint places Abdullah as a "highly placed leader of a nationwide radical fundamentalist Sunni group" which aims to establish an Islamic state in America. It also noted that Abdullah preached offensive jihad and violence against law enforcement. "They're referring directly to what is going on overseas and the resistance and suicide bombings going on in Palestine, they're not talking about doing this here in America they're talking about overseas particularly in Palestine. But let me say this to you and to remind myself. Just because the people who oppress Muslims take certain means and do certain things that are totally unacceptable in our religion, and we feel like we have no other choice but to defend ourselves and this may be the only choice." Other government travel has included people whose organizations are affiliated with the Muslim Brotherhood, an Egyptian-based movement that seeks to spread Islamic law throughout the world. Among them was current Islamic Circle of North America (ICNA) President Zahid H. Bukhari - at a total cost to the taxpayers of over $60,000. From 2004-2007 Bukhari traveled to India, Pakistan, Portugal, Latvia, Russia, and Bosnia and Herzegovina, speaking on topics from "Black Muslim Roots in America" to "The Emergence and Development of Islamic Civilization." ICNA's ideology is based on that of Jamaat-e-Islami, a group which calls for an Islamist revolution and Islamic state in Pakistan. An introductory pamphlet for ICNA in the U.S. describes a similar goal, "to achieve the pleasure of Allah through the establishment of the Islamic system in this land." The FOIA records also show that Mohamed Magid, Vice President of the Islamic Society of North America (ISNA), traveled to the Middle East in November of 2007 through the Citizen Exchange Program (CEP). That program is run by the Bureau of Education and Cultural Affairs of the U.S. State Department. Magid was an adviser for the Sterling Charitable Gift Fund, which was raided by the U.S. as part of the SAAR Network, a network of groups suspected of terrorist connections. A government affidavit stated that the Sterling Charitable Gift Fund was used for money laundering and terrorist financing. "I think somebody made a mistake and put a zero, they had no problem. But what happened in this issue here, things escalated and people called it genocide. There is a fight, people have been displaced, people lost their homes and they need help but at the same time I want to say there is some kind of exaggeration of the some of the problems." Like CAIR, ISNA was an unindicted co-conspirator in the HLF prosecution. It was listed among "entities who are and/or were members of the US Muslim Brotherhood." Muslim Public Affairs Council (MPAC) Executive Director Salam al-Marayati, who has called Hizbollah's violence "legitimate resistance," accepted an invitation from the State Department to travel to Europe in January 2010 to speak about religious freedom and free speech. Al-Marayati's organization has a long history of defending designated terrorist organizations and their supporters, opposing U.S. counterterrorism efforts, and espousing anti-Semitic rhetoric. In addition to sponsoring trips abroad, the State Department has also coordinated meetings between American Muslim Brotherhood groups and several delegations coming to the U.S. Through the State Department's International Visitor Leadership Program (IVLP), at least six delegations visited CAIR from 2002-2007. In another instance, the State Department's IVLP program sponsored a visit by a Palestinian news crew in July of 2009 to the Brotherhood-affiliated Muslim American Society (MAS), in order to conduct interviews and discussions for a documentary to improve the attitudes of Palestinians toward U.S. policies and Americans. 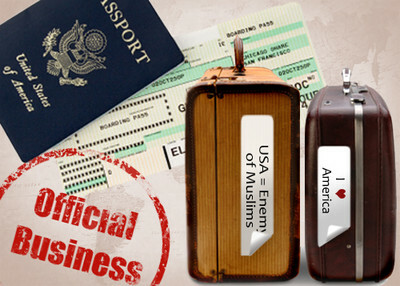 The U.S. could find better candidates to travel abroad to represent U.S. Muslims. Contacting individuals with a black and white view on terrorism- that it is inexcusable in any form and should not be written off - would be a nice start. Dear Mr Emerson. All of the above are small fry compared with the big-leagues of american sponsorship of terror. Take the Dayton force beimng trained in Jordan to take over the heartland of Israel. The personnel of this force are exactly the same shabbab which is the back-bone of Hamas, raised in the same UNWRA hamas-PLO directed schools which call for the annihilation of the Jews of Judea and their replacement by Muslim so-called Palestinians. The Dayton force costs american tax-payers a few hundred millions annually , and all it is, is a terrorist arm of the PLO. And the elephant in the room is UNWRA, whcih costs billions annually, maintaining millions of refugees in abject conditions on a steady diet of replacement of the Jews in Israel with themselves. So the good-will appologetics who simply explain the facts to the Muslims, that the USA is their best friend, their best sponsor, and the only entity which keeps the whole Palestinian hoax from collapse, is indeed small fry. Go after the Big Fish, the funding for UNWRA, the funding for the PA (The PLO masquerading as a political entity) and the funding for the Dayton Terror Brigades, which one day will go after Americans, in the and around the ME. In this ideological war between islam/sharia and Western values, customs and law, supporting the spread of the opposing ideology is aiding and abetting the enemy and thus during a time of war is defined as treason. Now, if those signing the authorizations or directing same do not understand the consequences of their actions, then what? Does it still aid and abet? Yes. Does it still harm us in the short and long term? Yes. Must it cease? Yes. How? Educate those in power or replace them. I have my preference. You are either with us or against us. There is no middle. Either you support your nation or you you have made a choice to weaken or destroy it. And for elected representatives and those they appoint, either support your oath of office, or you you have made a choice to weaken or destroy the nation and its Constitution.